1. Moisturize you lips. If you have lip balm ,go ahead with that and if not, all of us have Vaseline lying in our dressing tables. I used Vaseline. 2. Outline your lips with lip liner pencil. 3. 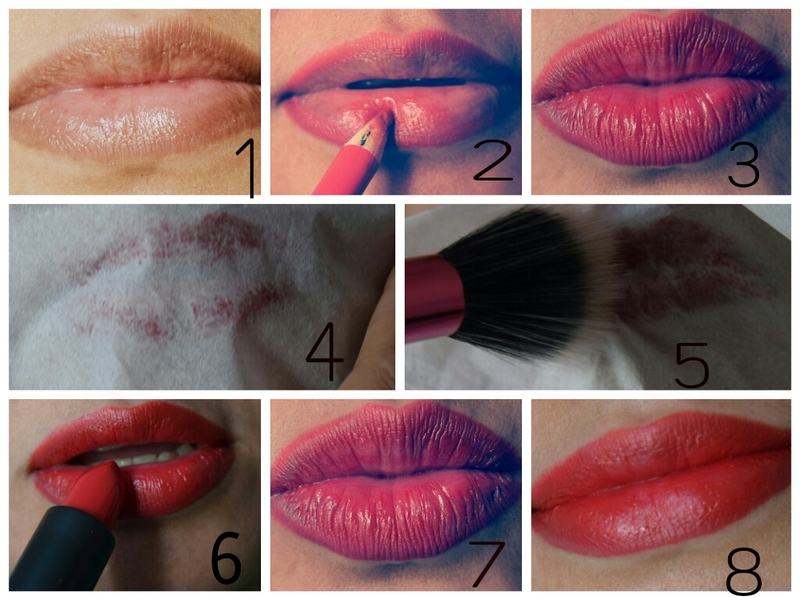 Apply the same lip pencil all over your lips , this will create a good base for your lipstick and give a very good color. (For some, they apply concealer or foundation on the lips , esp when lips are dark. You can do that before applying your lip liner. 4. Take a tissue paper , put on your lips ,gently press and using stippling brush , dab on it(tissue) little bit of loose powder. Any powder will do. I used baby powder. 5. Remove the tissue paper gently . Woah! this is my favorite part. It’s like a magic for me. The result is so different and it gives a very nice matte finish. But we aren’t done here yet. 6. Apply another layer of lipstick and you are done! Okay, so if you wish to, you can repeat steps 4 to 6 twice for a stronger effect. Sometimes, when I find my lipstick too glossy, I end on step 5 but repeating steps twice. There is really no hard and fast rule for applying make up, just play with it to get to know all the items you have and make the best our of it. If you liked my post, please join my facebook page by liking, to get updates. Thanks for sharing this I know I have been looking for a method and I think I will try this out.